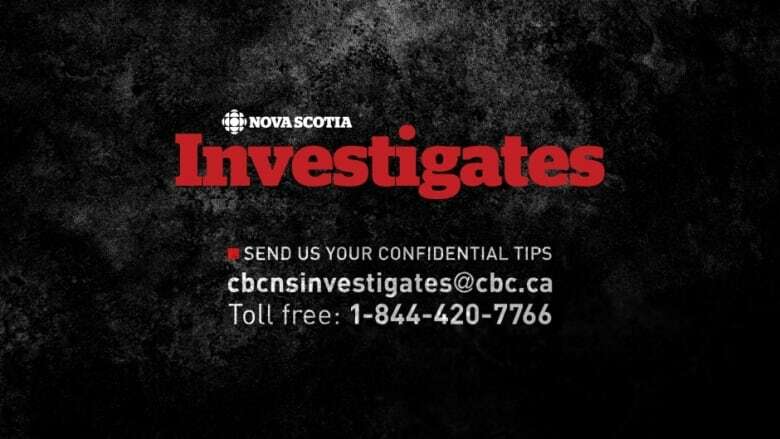 Two European seafood businesses are buying Facebook ads and posting warnings in online seafood forums after they say they lost money to a Nova Scotia seafood company. Two firms allege Oceanic Superfoods, which is run by David Brandal of New Minas, cheated them out of more than $30,000 when his company didn’t deliver product they had ordered. 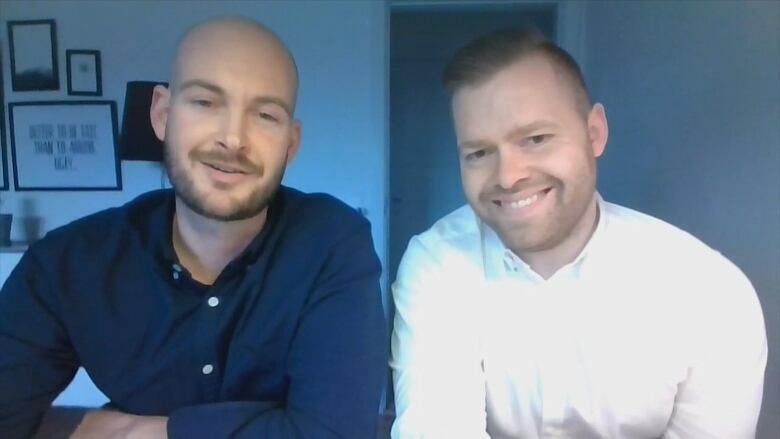 He said he and the other company, Royal Ocean Seafoods of Aarhus, Denmark, started the communications campaign so that nobody would else would suffer losses. Both companies say they connected with Brandal through online seafood forums. Brandal admits there have been problems with the orders by both companies, but he denies that anyone has been ripped off. He said he will make good on his debts to these companies. Sodderland said he looked to the Maritimes after exhausting his supply of seaweed close to home. “So, we started looking for new sources and dulse is something which is easily to be gotten in Canada, and most notably Nova Scotia and New Brunswick,” he said. Sodderland said he paid approximately $13,000 for a delivery of about 450 kilograms of dulse in early December 2018. He uses it in his company’s seaweed bacon. He said everything seemed fine at first. “When we were four or five weeks into it, it really started to look like something was off,” he said. Tracking codes that Brandal promised to send never arrived, Sodderland said. Eventually, Brandal admitted the dulse had never left Halifax. Sodderland said he arranged to pick up the dulse in Halifax several times, but Brandal always cancelled the meetings at the last minute. Sodderland said he has never received his seaweed or had his money refunded. 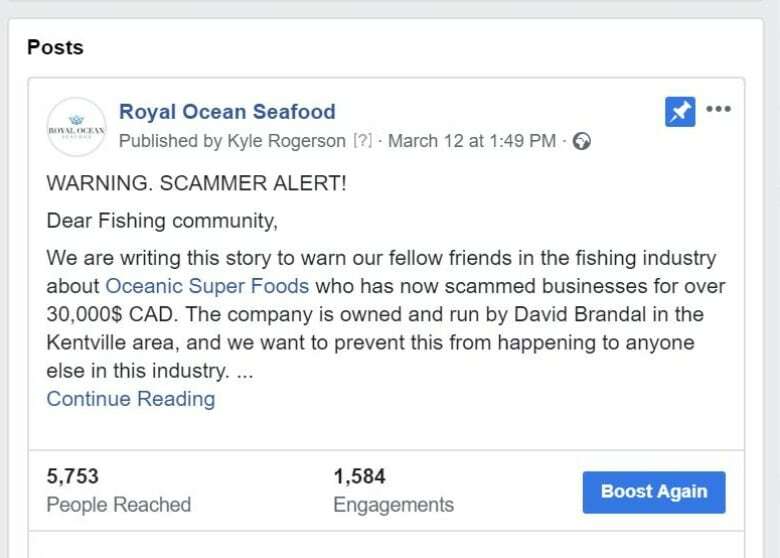 The owners of Royal Ocean Seafoods — Kyle Rogerson and Simon Bay — are also angry with Brandal. Rogerson is from Lower Sackville, N.S., and studied business at the Nova Scotia Community College, while Bay’s family works in the Danish seafood industry. “We really wanted to get the product from Kyle’s home to Denmark,” Bay said. They said Brandal told them he could source about 2,270 kilograms of high-quality salmon from New Brunswick. Royal Ocean found a buyer in Nova Scotia and sent Brandal $20,000. Everything seemed fine until the delivery date of May 14, 2018. “He cancelled the order a few hours before pickup … the truck was actually on its way and he cancelled a few moments before they were arriving,” Bay said. They said Brandal has since refused to return their money. “He just kept stalling and not answering for a few days and then making out excuses constantly,” Rogerson said. A small claims court in Nova Scotia has issued a judgment against Brandal and Oceanic Superfoods for $21,299.35. Brandal said there are reasons behind the problems that have occurred. “We’ve had no intention to harm or hurt anybody and that’s our position,” he said. He said in the case of the missing salmon, the price of the fish jumped by several dollars a pound, making the deal impossible. He said the $20,000 he received from Rogerson and Bay wasn’t just for salmon, but was a long-term investment in his company. “The salmon couldn’t come through, well, the price was just through the roof is what happened … and then they wanted to invest in the business for other product,” Brandal said. Rogerson and Bay deny there was any such agreement. They said Brandal later sent them a promissory note to return their money after a year with 10 per cent interest. They refused to sign it. Brandal said he plans to pay back the $20,000 he owes, with interest, in early May. “We are hoping Mr. Brandal honours these dates,” Rogerson said. When asked about Sodderland’s dulse shipment, Brandal told CBC News on April 5 that it was on the way. Brandal couldn’t remember the name of the shipping company, or of anyone who works there. Sodderland said he’s seen no sign of the shipment. “I”m afraid David is up to his usual tricks,” he said. Rogerson and Bay said the loss of $20,000 on their first major deal torpedoed their business. They say the worst part is the lasting damage to their reputation, both in Denmark and Nova Scotia. The pair said they are slowly rebuilding, concentrating on lobster imports to Denmark and halibut exports to Canada. 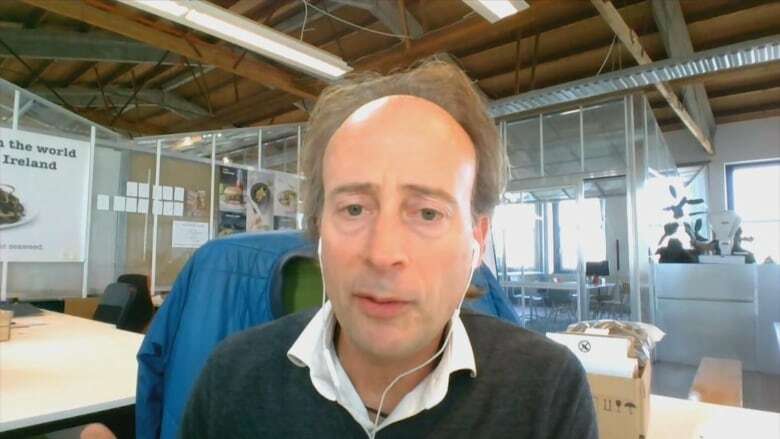 Sodderland said he initially soured on doing business in the Maritimes, but he found a new dulse supplier in New Brunswick and placed another order — this time with funds held in escrow.